Used to be, before digital photography, there were the art photographers over here, and family snap-shooters over there with a great gulf between them. The latter were thoroughly and properly intimidated by the former. No more. Though the art intellectuals continue doggedly claiming that photographs or digital art must meet their arcane and arbitrary standards before being allowed to be ‘art’, the rest of the world carries on in blissful, joyous disregard. There is a near total disconnect between what you see and hear in insider art magazines, web sites, blogs, and forums and what the great mass of the public (‘unwashed’ as they are sniffily called by the art politburo) is pouring forth, printing, framing and having a hell of a good time making. Dear pointy-headed know-it-alls, we don’t need you any more. Signed, your formerly browbeaten and derided customers and subscribers. The birds in my composites are anatomically incorrect. I always remove their tongues. First, because long, skinny, pointy things are always a problem in compositing, and second, because once the bird seed is removed (as it always is) the tongue has no business sticking out. 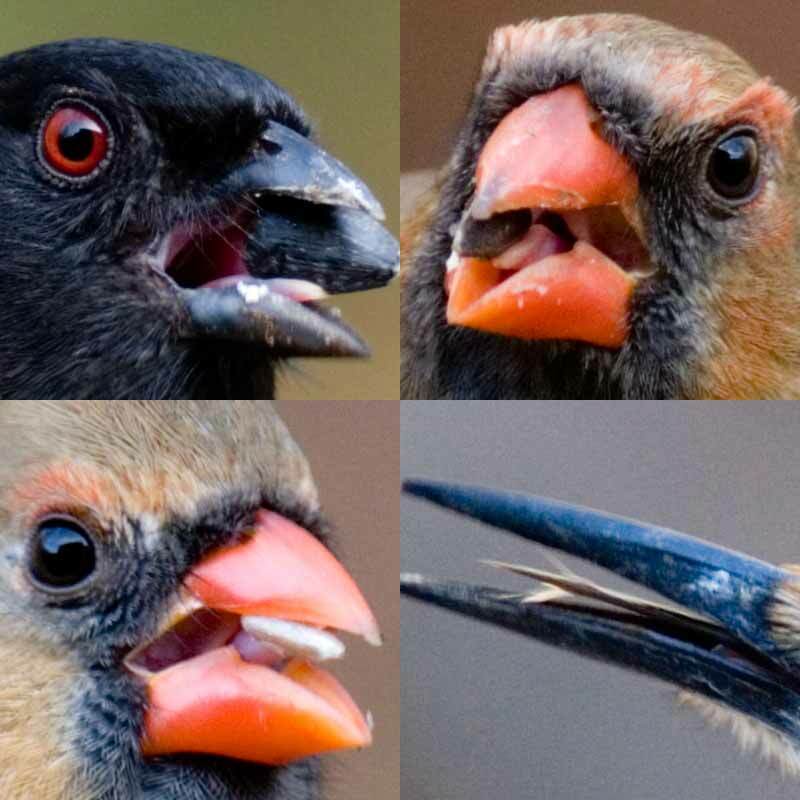 The only time I even think about leaving a tongue in the picture is when, as in the upper right sample shown below, you can see into the trough of the bird’s mouth. The tongue should be visible lying somewhere in the bottom of the beak, but since I don’t know what it would look like in that configuration, I can’t very well create one there. So, my birds have all been de-tongued. I also leave out the two or three long skinny hairs (feathers?) that always seem to grow on the top of cardinals necks right where they meet the body (what would be the withers in a horse). Again, too skinny and long to be extracted cleanly, and just not worth the extra trouble. The samples shown are straight crops from 100% view of originals. They should give you some idea of the true size of the composite images I make as compared to the extremely downsized versions that I show in this blog and on my web site. I print with an Epson 4000 which I got whenever it was that they were new (3, 4 years ago?). Getting it delivered to my very remote location was a nightmare. Getting it upstairs to where it needed to be was life-threatening. As with most Epson printers, it clogs regularly. I print on Thursdays, and on that day, from the instant the alarm goes off in the morning, I am dreading the nozzle checks that begin every print session. Now that it’s getting old and there are better printers available, I’m thinking about getting a new one. However, I have no idea how to get this monster out of the house. It’s huge, weighs a ton, and probably not acceptable at the local landfill. They should build houses with printers already installed, like washing machines and stoves. Within every field of creative expression, visual arts, music, literature, etc. there tend to spring up trends, techniques, biases, that are known exclusively to those closely involved with the community of artists currently working in that field. Human nature being what it is, such trends tend to intensify. The useful cause of the original technique or bias is soon lost as the method or bias balloons into a bizarre parody without any reason other than competitive self-reference. In photography, the result is pictures for which the sole meaning or use is as a test of the viewer’s insider knowledge of the field (current and past). Such pictures are dependent, for effect, on a viewer’s knowledge of what is not there. Exclaiming over the clever excellence of such work, those few who are ‘in the know’ rush eagerly to join the anointed, the elite. Such art, and its devotees give me the creeps. This is the same we/they tendency that results in everything from grade school cliques to racism and bigotry. The point is not so much who is in as who is not. The point is to exclude; to elevate oneself at the expense of someone else. That elevation is the point, not whatever it is that is being used as the comparator. * the photo blogging elite would never use the phrase ‘give me the creeps’. I have given this information so many times, to so many people … it really gets old. But it is essential, basic, must-know material so here it is, one more time. Aside from shape and tint, the position, strength and angular width of the light source causing a shadow has three distinct effects. Note that these are independent of one another. The cause of each effect has no bearing on the cause of the others. Stretch and compression are caused by the non-linear difference between the location where a shadow strikes the receiving surface when it is close versus when it is farther away. It causes stretch (non-uniform elongation) when the light source causing that shadow is nearly parallel to the receiving surface – and compression when the light source is nearly at right angles to the receiving surface. Think about the transition from right angle light source to parallel light source. Also think about drop shadows from different heights (as opposed to cast shadows) in those conditions. See if you can figure out why you have stretch and compression. Fade is visible in a shadow when the primary light source (the cause of the cast shadow in question) is not much brighter than the secondary light sources in the scene. What you are really seeing is overlapping shadows, but the secondary light source shadowing outside of the cast shadow is overwhelmed by the brightness of the primary light source. When the primary light source is much brighter than the secondary light sources, fade within a shadow will be so slight relative to that main light source, that is won’t be noticeable. This is very easily studied in your own home. Not only will you usually have multiple lights on at the same time, but light colored walls make for quite strong bounce fill (as secondary sources). Look around you and think about what you see. Edge blur is caused by the angular width of the light source relative to the object in question (how big the light is combined with how close it is). Light coming from one side of that light source casts a different shadow from light coming from the other side of that light source and all points in between cast slightly different shadows. Thus you get edge blur from wide light sources and no edge blur from point light sources. Once more, it’s especially easy to study edge blur indoors. The sun, because if its extreme distance, is effectively a point light source (on a clear day; in haze it smears to have some angular width). When I was little, when the buttercups would bloom in the springtime, we would hold one of them under our chin and have someone else look to see if our skin turned yellow next to the bloom. If it did, that meant we liked butter. It always did, and we do like butter. Very much. How does a buttercup reflect its yellow color while it is being held within the shadow under a person’s chin? Shadows are not ‘things’. They are a light deficit relative to the rest of the scene. Other than the light which is ‘casting’ it, a shadow contains all of the (same) light as does the rest of the scene. (If there were no light at all in shadows, you wouldn’t be able to see anything in them.) There is plenty of light under ones chin that can reflect off of a buttercup and carry with it the color of that flower onto your skin. Which brings me to the next point: shadows are not gray. They carry the tint of whatever is lighting them. This is commonly the sky (blue) but can be anything that is nearby such as foliage (green). In addition, within concave areas (the indent between flower petals, or the curvature where and object meets the ground) the thing casting the shadow will usually bounce light onto itself thereby boosting its own color. Which brings me to the third point: not only are shadows not gray, they are more often than not, more, not less, saturated than the non-shaded parts of an object. This may be because shadows are usually lit by bounce light which almost always carries a tint, while the primary light is generally more nearly white. It is also because of the self-bouncing already mentioned, and can be because of translucency such as with flower petals. Where light is passing through the flower into the shadow, carrying the flower’s own color, it strongly boosts saturation. To investigate this for yourself, open any of your own photographs, in Photoshop set the Info palette to show HSB colors and then drag your cursor over lit and shadowed areas of a uniformly (approximately) colored object. Watch the S (Saturation) readout in Info. Now that you understand that the main cast shadows that you see in a picture contain all of the light in a scene other than that of the primary light, you will not be surprised when I tell you that shadows are themselves full of shadows. Whether or not you can see them depends on the strength of the primary light relative to the many secondary light sources (bounce, as well as light-emitting sources). Overlapping shadows cast by different objects but caused by the same (single) light source are not darker where they overlap. You can only block the same light source one time. However, overlapping shadows cast either from the same object or different objects and caused by two different light sources will be darker where they overlap. Where they don’t overlap, the light from one source is being blocked; where they do overlap, the light from two lights is being blocked. It’s very easy to observe this in your own home — where you have multiple light sources of nearly the same brightness. When looking straight down at things on the ground, you should not be able to see any of the shadow that is under that stuff on the ground. However, when compositing to this view, as I often do, I have found that I always shadow the objects as if I were seeing them tilted a little bit away from me such that I can see some of the shadows on the ‘lower’ side of the picture (there is no ‘lower’ in a straight-down view). I first noticed this when working on the Four Ways series and then very strongly in the Mind Game group. At first, I would go back and correct it, but the fixed shadows looked wrong – even though I knew they were right. So I have given in and now I do it this way because it just feels right — even though I know it’s wrong. Because I am looking at a vertical image (on my monitor; on the wall) I have a vestigial pull of gravity and a wish to place the sun ‘up’ rather than laterally. Below is the same image that I posted a few days ago, only I have flipped it. See if it doesn’t give you a bit of vertigo. If it were correctly lighted (looking straight down), flipping a picture with rigid symmetry such as this should not make any difference. If I build a composite on a background that has no obvious existing light direction (either it was photographed in truly diffuse light, or it has no shadow-casting content), I can choose any light direction for my composite content. Light direction, and especially cast shadow direction are a strong part of a composition. Those shadows ‘push’ insistently in a particular, uniform direction. This is a powerful ingredient in the dynamics of a picture. Use it to amplify, not resist the intent of your image. I frequently see composite pictures posted on photo critique sites that I am fairly sure are using parts that were not photographed by the person posting the composite. Please be aware that if you do not have permission to use every piece of every image or portion of an image that you display or use publicly, you are in violation of copyright law. Make all of your own composite components. Aside from copyright issues, I think a picture made using other people’s pictures is not really your own. Sole authorship matters. 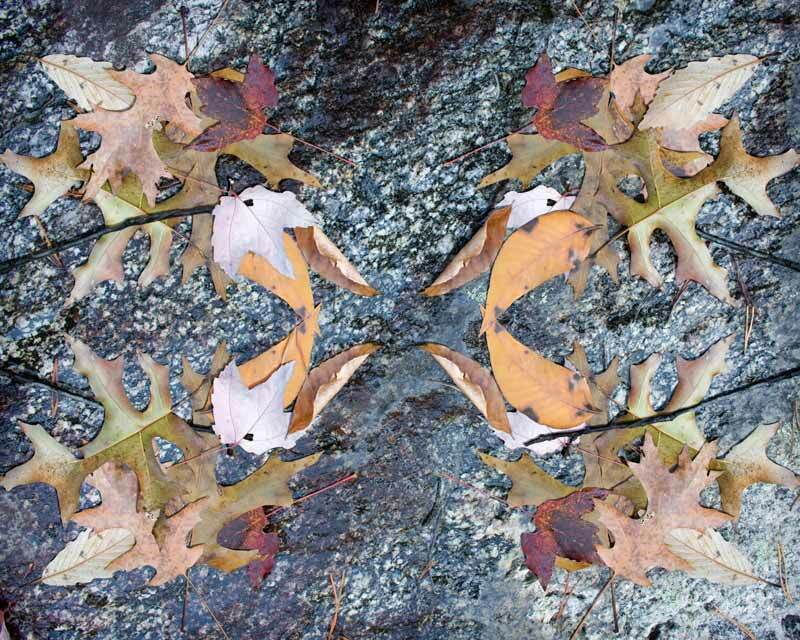 I do a lot of bird composites ( Judgement Day, Summer Birds, Winter Birds, Bird House and Shadow Birds ). To make pictures using only one bird you can probably shoot them anywhere, but to make an ensemble using many birds, it’s best if you collect your shots with that use in mind. This means getting them all in the approximately the same light, at the same distance and same angle. Here is how I do it. I put seed on a board that is about five inches wide and which is positioned parallel to the window behind which I have my “blind” (a painter’s drop cloth with a lens-size hole cut in it). The narrowness of the board (actually my deck railing) causes all birds to be at the same distance and its height determines the angle of view. By putting seed only on the part of the board that is in front of my camera, I get the birds into exactly the right place. (To get them used to such spot feeding, start with bird food on the entire length of the board and gradually shorten the span over which you spread it). My birds must not be in full sun. I can’t composite an object with strong, harsh shadows on it. For this reason, the chosen railing/board is on the north side of my house. It is shaded by the house for about an hour every morning from November to mid-May. During the summer months, the sun is far enough to the east to get behind the house, so I can’t shoot birds from June to October. To get the birds to show up during the desired hour of good lighting, I start by putting out feed all the time, and then gradually limit the time, putting it out for only the morning, then only for a few hours, then only for the time during which I want to shoot. The birds learn pretty quickly when chow time is. In order to make a group picture with birds, the participants must all be reacting in perfect harmony. This requires an enormous pool of bird pictures from which to choose in order to get matching or suitably coordinated poses. I shoot birds all winter, then mask several thousand through the spring (as I am still shooting). During the summer, I make the composites.